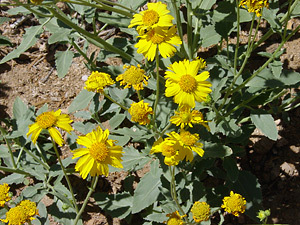 Habitat: Desert, Upland, Riparian. This somewhat weedy wildflower is often found growing in pastures and other sunny locations where it can get a little extra water. 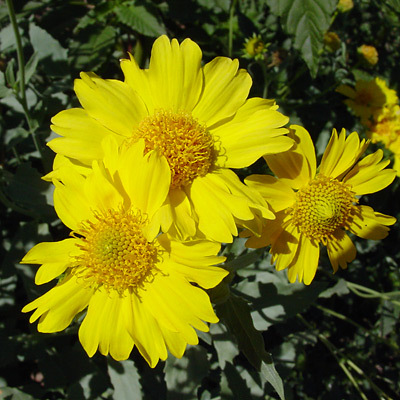 Description: The flower heads are up to 2 inches (5 cm) across and have yellow disks and broad, 3-toothed, yellow rays. The leaves have toothed margins and are silvery green in color. The leaves vary in shape and arrangement on the plant and are typically narrowly triangular and opposite lower on the plant and lanceolate and alternate higher on the plant. Poisonous – The plants contain galegine and are poisonous to grazing animals like sheep and goats.